Vrooooom!! 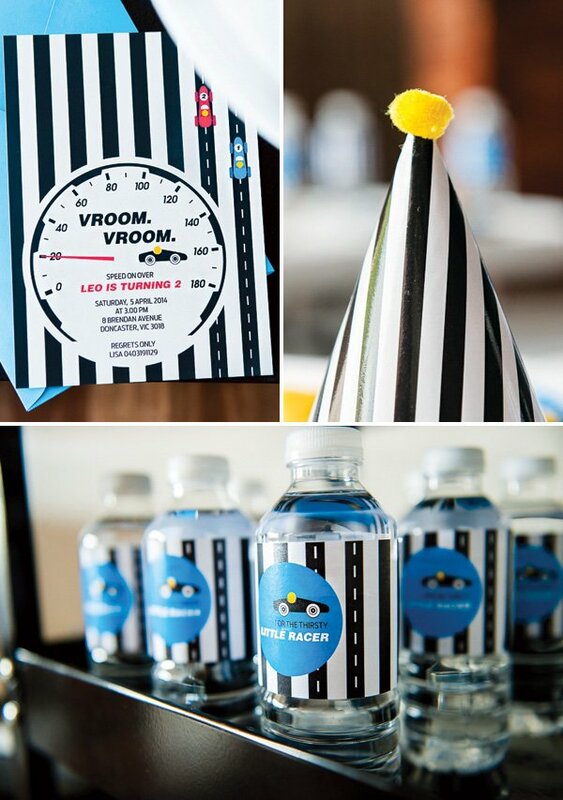 Don’t blink or you might miss this Sharp & Modern Race Car Birthday Party zooming by! 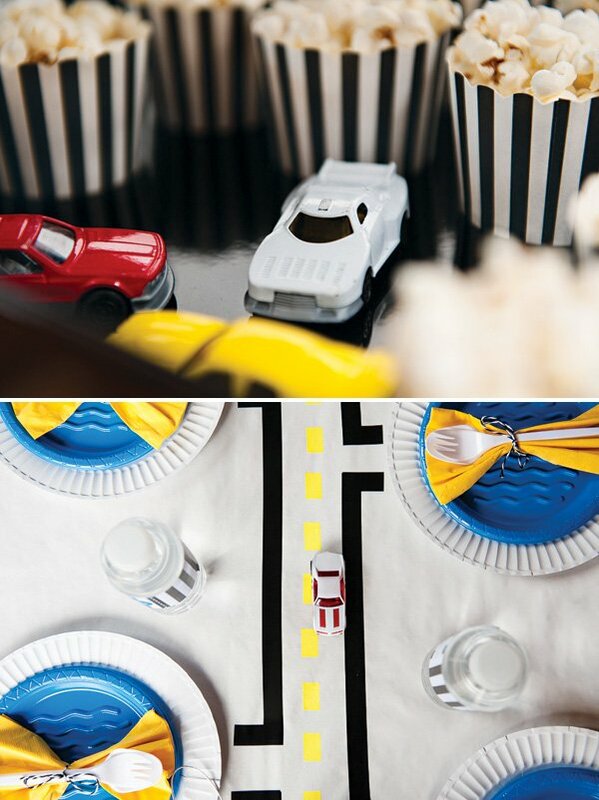 Lisa Plafadellis of Lettuce & Co styled this stylish party for her son, who loves to play with Hot Wheels, with clean lines and chic desserts. 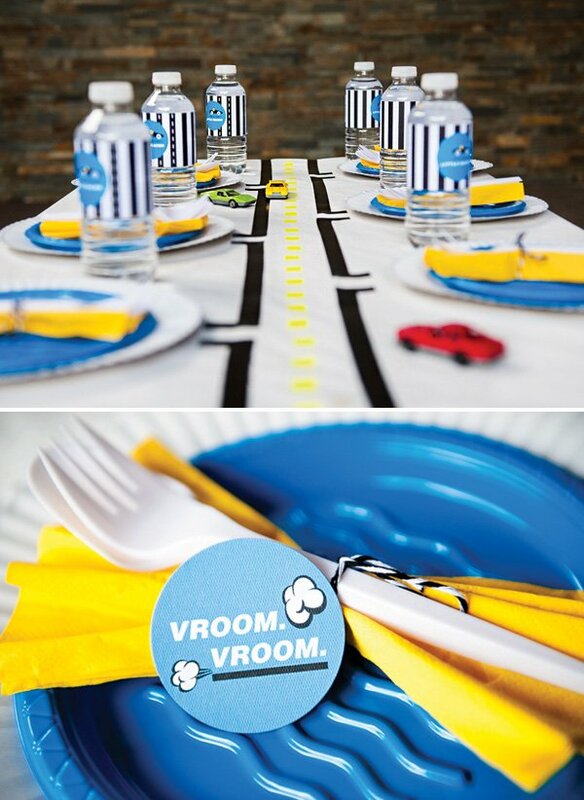 There are so many cute ideas & DIYS, but I think my favorite is the roadway tablescape, with bright yellow lines & pathways leading to each place setting — definitely wins 1st place in my book! 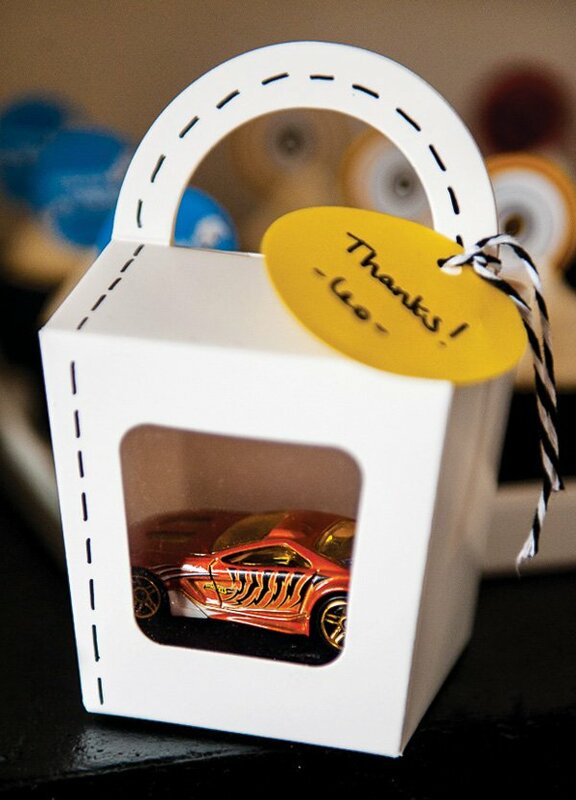 What little boy doesn’t love cars?! They are the perfect fit for their chubby little hands, they have wheels, they go vrooooooom and this was no different for Leo. From an initial love for Disney’s Lightening McQueen to any car with wheels, a car party was the only theme fitting for his second birthday. 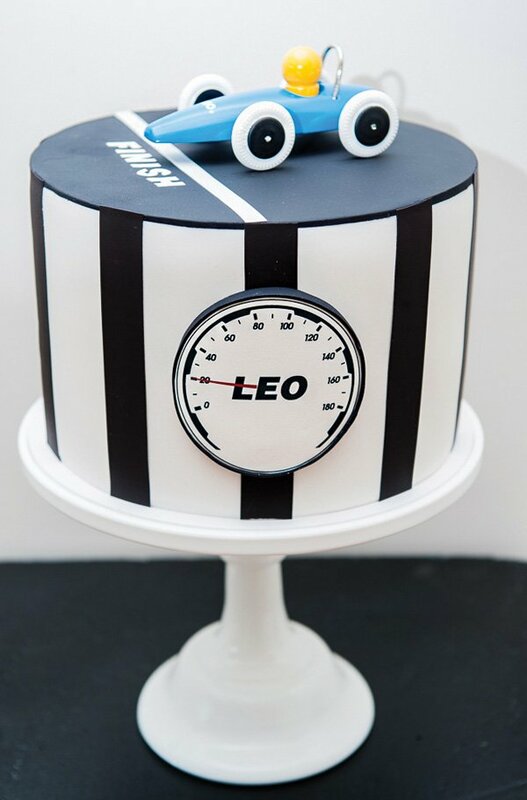 As Leo’s mum, and event stylist/planner, I set off to create a car party unlike the traditional black and red with the black and white check but one with a modern and stylish look. It all started with THE CAR…a sleek and shiny blue race car… not only does this car ooze style, but it formed the path in defining the colour palette — black, white, blue and yellow. I also snuck in the colour red as we all know that red cars go faster :). With the feature car and colour palette confirmed, the remaining theming was keeping minimalist in mind. I wanted to tie in the traditional checkered flag, but modernize it by going with black and white vertical lines, which were featured in a few key elements. We all need sweets at a party…and the birthday cake needs to go somewhere, so why not make it the focal point and theme around the cake. 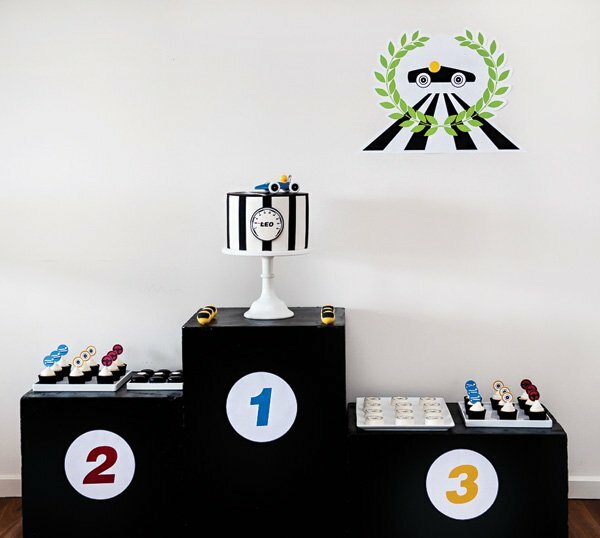 I thought outside the box and instead of using a table to house the sweets, I painted poly blocks to create a podium style set up, with the cake standing high and proud on the winners podium. 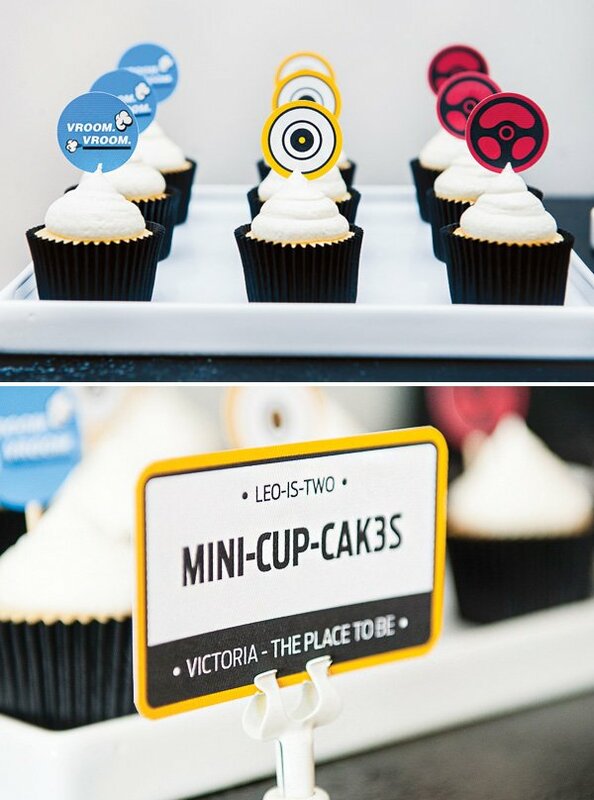 All of the other themed sweets, including speedo ‘x-l-r8’ chocolate coated Oreos and CUPcakes, were placed on the other two podiums. 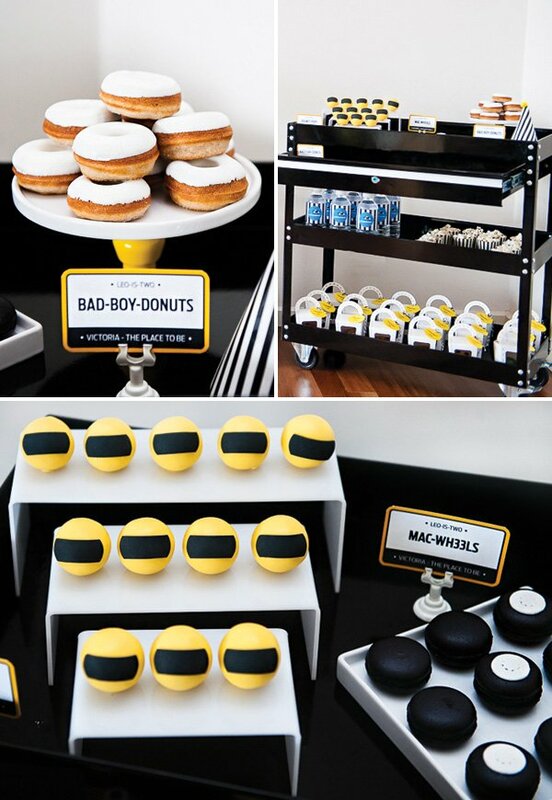 The helmet cake pops, ‘bad boy’ donuts, ‘vroom’ and race car cookies, ‘MAC wheel’ macarons and gift party bags (individual race cars boxed with a road drawn around the handle by yours truly) were placed on a three tiered mechanics workshop trolley. 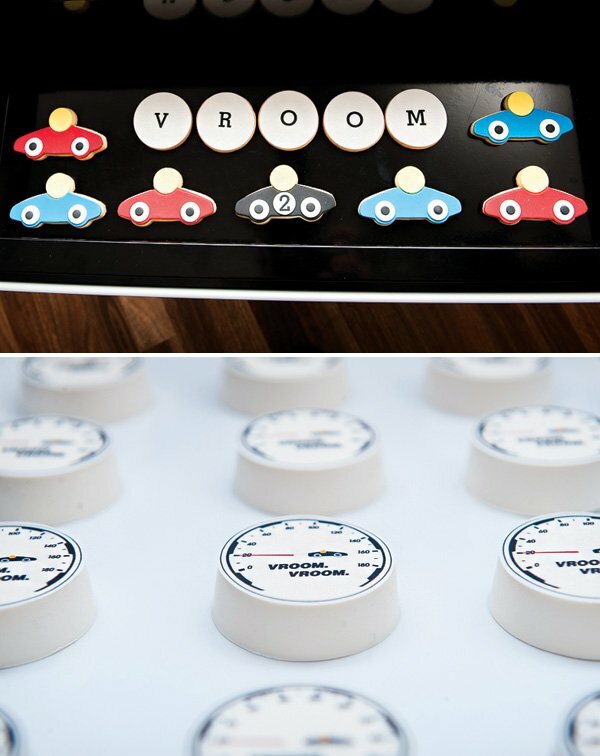 Out in the garage, two tables were set and styled for the birthday boy and his little friends to sit and enjoy a racing feast. The tables were designed to look like roads and side streets — this was where my love for DIY came into play. It took hours of paper, tape, precision and love and it was all worth it when my boy squealed in excitement at first glance of the tables. 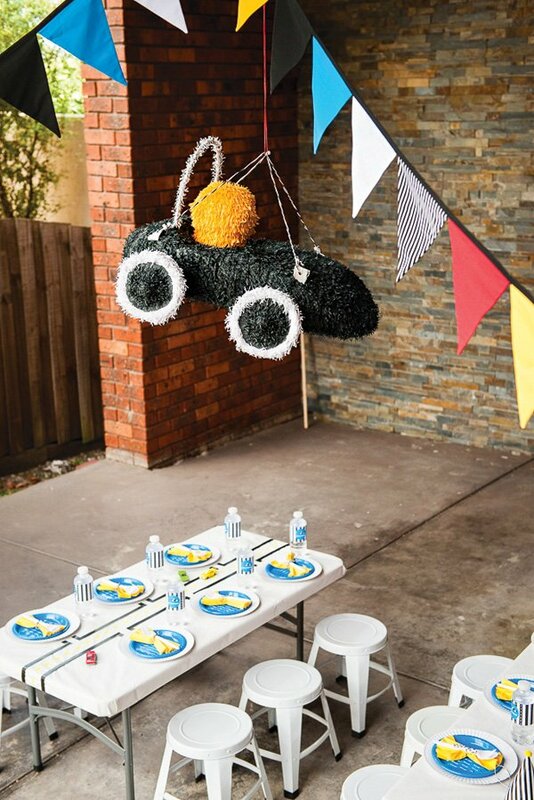 Overhanging the children’s tables was a custom made piñata of the featured race car and flag bunting. After lunch, the children were led to the race track where they took turns in a four car race in DIY cardboard box cars. this seemed to be the highlight of the day, all children wanting numerous turns at racing…I almost ran out of prize trophies! 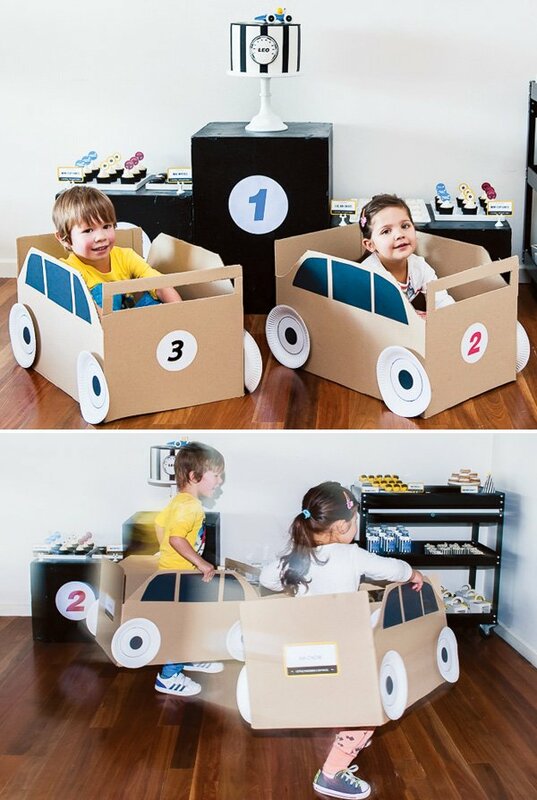 Where did the cardboard cars come from the children faced with?